Second thoracopod of a spearer (top) and and a smasher (bottom). Image provided with permission from Roy Caldwell, U.C. Berkeley. The most distinctive feature of a stomatopod is the raptorial second thoracic appendages. These are massive appendages that come in two basic types, smashers or spearers. Smashers have a thickened, hard pad on what could be loosely compared to their elbow. They use this pad to strike at passing prey or rival stomatopods. They are capable of crushing mollusk shells and instantly killing prey with a blow of this structure. This fact makes some of the larger species difficult to keep in aquaria since they are capable of breaking the glass with one quick blow. The spearers have tough spines instead of a hard pad on the second thoracopod and use it to spear their prey. The force and speed generated by the second appendages is astounding. 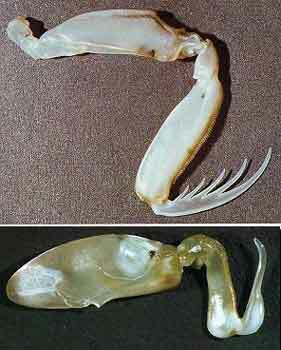 A stomatopod's long abdomen has little musculature compared to a lobster. The abdomen supports the flap-like pleopods which hold the gills and are also used for swimming. The tailfan, made up of the telson and uropods, is often elaborate with spines or other armor and vivid coloration. The tailfan is used to hold the abdomen and gills above the bottom, to block the burrow entrance, and to signal other stomatopods. Visit the UCMP special exhibit Secrets of the Stomatopod: An Underwater Research Adventure to learn more about some of the unique features of stomatopods (including the eyes and raptorial appendages), and about a 2001 research expedition to study stomatopods in their own habitat.